Maximizing Access to Research Careers (MARC) graduating seniors, Elena Arroyo (Physics), Madison Kennedy (Biochemistry) and Rifqi Affan (Psychology) received the highly competitive 2018 National Science Foundation (NSF) Graduate Research Fellowship Program (GRFP) award this month. Through a national competition, the NSF-GRFP program recognizes and supports outstanding students who have a high potential in, and who want to pursue a research-based master’s or doctoral graduate degree in science, technology, engineering, and mathematics (STEM) or in STEM education. The GRFP provides three years of support for the graduate education of individuals who have demonstrated their potential for significant research achievements. Since 1997, a total of 16 MARC scholars in the Colleges of Sciences and Engineering have received the NSF fellowship to further their research studies. Of the 12,000 applicants who applied this year, 2,000 awardees were selected through the NSF peer review process. Applicants represented a wide range of scientific disciplines and came from all states, as well as the District of Columbia and U.S. territories. 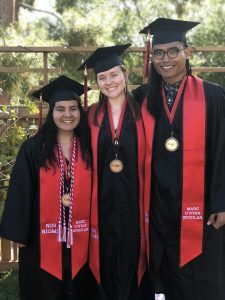 Elena, Madison and Rifqi were three of the 750 undergraduate seniors who received this award. A total of four students in the College of Sciences at SDSU were honored with the NSF this year, but 62 (including those in the College of Engineering) since 1997. We congratulate our three MARC scholars for this great accomplishment and wish them continued success in the future. We also express our appreciation to their mentors, Dr. Arlette Baljon, Dr. Christal Sohl, and Dr. Ksenija Marinkovic, for their support and guidance provided to our scholars. MARC would also like to thank, Maureen GIbbins Paolini, who every year works closely and spends many hours with each scholar that is applying to help perfect their application. In addition, alumnus Mirae Lee (2014-2016), a second year Microbiology Ph.D. student at the University of Chicago received an Honorable Mention recognition from the NSF Graduate Research Fellowship Program.